The Playa de la Rambla de Elena is one of a long series of unspoilt and picturesque beaches and coves which lie on the eastern coast of the municipality between the headland of Cabo Cope in the south and the Playa de la Galera, which marks the boundary with Lorca a few kilometres further north. Like almost all of the dozen or so wild natural beaches on this stretch of the coastline, its location and the lack of easy access goes hand in hand with there being no facilities to speak of. The beach is cleaned regularly, but apart from rubbish bins has no “mod cons” and no serviced lifeguard, however, for the type of individul who seeks out these gloriously unspoilt natural beaches, this is a big plus. The beach is listed as 450 metres long, and the sandy surface continues for some distance offshore. This makes for easy and safe bathing, and this is one of the most recommended stop-offs on a trip along this part of the Águilas coast. 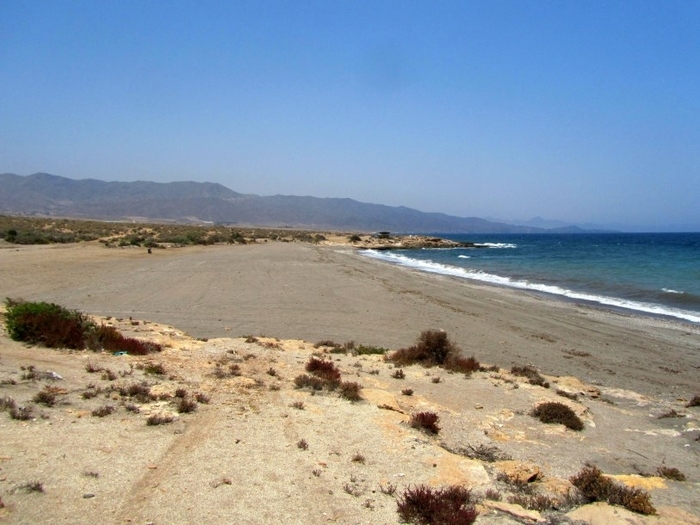 This is one of the most southerly of a string of beaches along a coastal track which can be accessed from the RM-D15 road: the northern end of the track is best reached by heading off the road at the bar-restaurant El Pocico and following tracks across farmland down to the coast, while the southern end heads back up to the road at Playa del Rafal. The driving on this route is sometimes far from conventional, but if taken slowly is not especially dangerous and off-road vehicles are not a necessity! There is also the convenience of the El Pocico restaurant, which serves good staple Spanish meals, tapa and refreshments throughout the year. 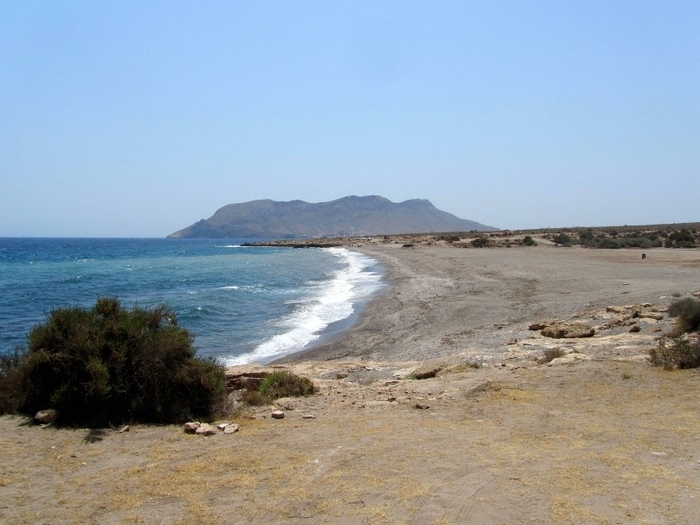 This is the thirtieth beach in the series of 36 Águilas beaches which run along the 28 kilometres of Águilas coast, working from the Almería coastline in the west down to the Lorca municipality and offer both urban and wild beaches.